Features a welded top and bottom frame. Tempered glass and fold back doors. Double hung 'E-Z Kleen' kettle is removable. 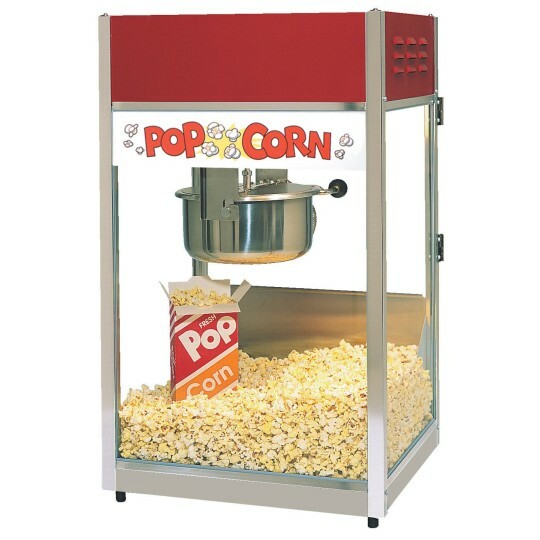 This movie-style popper features a welded top and bottom frame, anodized aluminum finish, tempered glass and fold back doors. The exclusive double hung 'E-Z Kleen' kettle removes for easy, convenient cleaning and features a stainless steel shell. Pops 6 oz. of popcorn every 3-1/2 minutes. 18"W x 31"H x 16"D. Operates on 1220 watts, 15 amps, 120 volts and is available in export voltage. UL listed. Weighs 60 lbs. Great size and is of quality construction. Easy to use and clean and is very dependable. Has been worth every penny. Makes great popcorn!